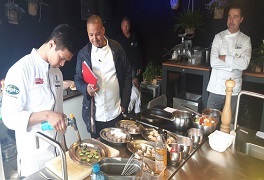 Local tradition and Thai roots was the innovative recipe that won the preliminary contest for top young chef in North Brabant. Bon Sawatdee, aged 24, won the Preliminary and will now represent North Brabant at the European Young Chef Award 2017 next November in Sant Pol de Mar in Catalonia. Six chefs competed on Sunday 10 September: they were given two hours and told to use typical products from the region to produce an innovative dish which would cost no more than four euros per person. Bernand Kuenen, a jury member noted that the winning plate was “Creative both in taste and presentation.” The recipe, Burgundian’s beetroots, Brabant lobster with pumpkin, coconut foam and oriental vinaigrette, for the judges presented the perfect mix between Brabant tradition and the Thai roots of Bon Sawatdee. Bon Sawatdee will join finalists from other European Regions of Gastronomy in Sant Pol the Mar, 5-6 November for the European Young Chef Award 2017. The competition, promoted by IGCAT International Institute of Gastronomy, Culture, Art and Tourism inside the European Region of Gastronomy framework, will be hosted by EUHT StPOL. Ten awarded European Regions of Gastronomy will each be represented by an aspiring chef who will prepare a dish, judged then by a jury of star chefs and international experts. Innovation on tradition is the theme of the competition under the auspices of the top Catalan chef Joan Roca, member of the jury in 2016 and Ambassador of the event. Greek celebrity chef Argiro Barbarigou from the winning 2016 region will join the jury and Stamatios Misomikes, the winner of the European Young Chef Award 2016, will give a Master Class for both finalists and culinary students from EUHT StPOL. IGCAT (International Institute of Gastronomy, Culture, Arts and Tourism) is a non-profit organisation established in 2012 working in the fields of gastronomy, culture, arts and tourism. Through its worldwide network of experts, IGCAT aims to empower local communities by guiding, facilitating, and supporting local leaders in cities, regions and cultural projects to understand the potential of their distinct food, culture, arts and sustainable tourism assets. IGCAT is furthermore the official secretariat for the Region of Gastronomy Platform and provides the European Region of Gastronomy Award, the European Young Chef Award and the Innovative Food Souvenir Award.